Flutees protective sleeves for ear studs slide onto the post of the ear stud to keep the metal from touching the earlobe, thus protecting sensitive skin and preventing discoloration. 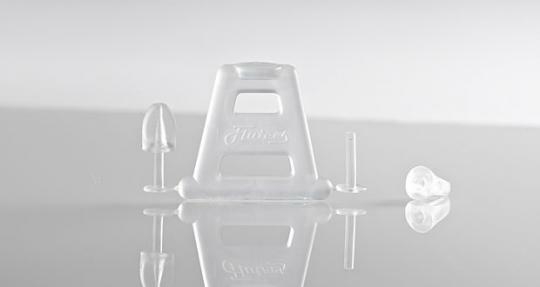 Flutees® are the invisible solution for earring lovers who have had enough of ear jewels that itch, irritate and discolour the ear hole. Any contact between ear stud and ear hole is effectively avoided by simply sliding the Flutees® protective sleeve over the pin of the ear stud. You no longer have to pay attention to the material when buying ear studs, but can go for whatever you like. Flutees® protective sleeves made out of medical plastics avoid contact between ear studs and ear hole. Flutees® protect against inflammation caused by impurities and allergic reactions when wearing ear plugs. Your ear hole itches and burns when wearing earrings? You can not wear earrings because your ear holes gets inflamed? The plugs of your silver earrings turn black? Contact of the skin with metal or impurities of the earring can be the reason for this. Flutees® reliably avoid contact of the earring with the ear hole and thus prevent from allergic reactions or inflammation. The skin in the ear hole is sensitive and thin. Flutees® protect this sensitive skin from impurities and from contact with nickel, cobalt, copper or other metal ions that cause allergic reactions. 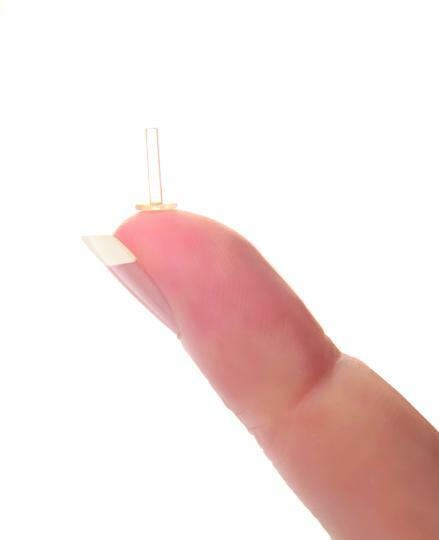 Flutees® are made of a high-quality medical plastic. They are produced and packed in a clean room under a strict quality management. Each pair of sleeves comes with two caps, hygienically sealed in a medical foil bag. Each pack of Flutees® contains 5 pouches with 2 sleeves and 2 caps. Use a new pair of Flutees® for each application. Flutees contain neither latex nor silicone. 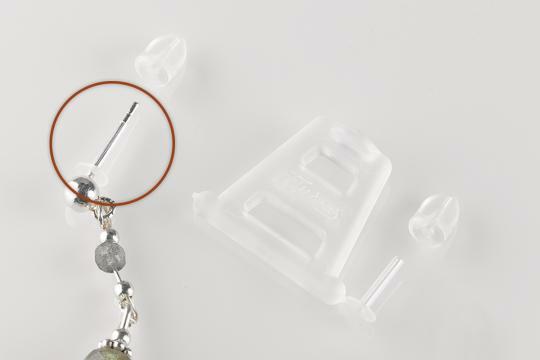 With help of your ear stud, twist the protective sleeve out of the clasp. Then insert the sleeve with the ear stud in your ear hole and secure the stud along with the protective sleeve using the enclosed fastener. Flutees sleeves can only be used together with ear studs. Please do not twist the sleeve and do not use it on earring hooks. For hygienic reasons, we recommend using Flutees protective sleeves no more than once. The grip of the fastener is reduced through humidity and fat. This will occur when the fastener is used a number of times. Ear studs with heavy or drop-down jewels should only be worn with freshly opened Flutees, otherwise there is the risk that the fastener will not hold the ear stud effectively. For very sensitive people, the jewellery part of the earring should not protrude over the shielding plate of the sleeve. Otherwise, the part of the earlobe, which also extends over the shielding plate might react sensitively to the decorative part of the ear stud. The idea for developing Flutees protective sleeves was born out of the founder being personally affected by the discomforts, such as moist and burning ear holes, caused by wearing earrings. Therefore, the quality of Flutees protective sleeves has always been important to me. The main objective of the development work was to generate a product of excellent quality, which fulfils the highest safety and security demands. The CE mark on our products confirm that we meet the requirements laid out in the provisions of the Medical Devices Act in accordance with Directive 93/42/EEC and that we have undergone a conformity assessment procedure to verify compliance with European standards. For the Flutees protective sleeves for ear studs, we use biocompatible material. As established by law, this, when coming into contact with living tissue, will not have any negative influence on the metabolism. Biocompatible material cannot be: toxic (poisonous), carcinogenic (cancer-causing), mutagenic (genotype altering) or sensitizing. Despite its slim texture the protective sleeve offers the highest possible stability. The production tool is designed in such a way that sharp edges on the front area of the sleeve cannot occur. Additionally, this area is rounded off. 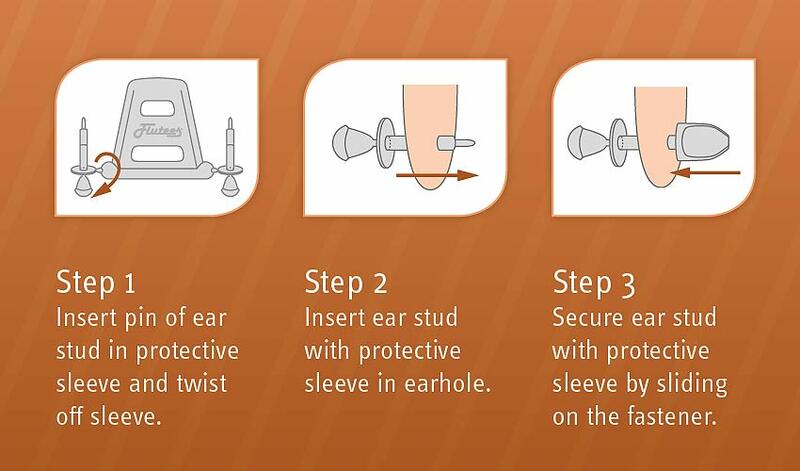 This method, along with a subsequent fine polish, guarantees a smooth and safe insertion of the sleeve into the ear hole. The “shielding plate” – the part of the sleeve that shields the earring stud from contact with the ear lobe – is not polished. This is the only way to achieve the matte transparent surface, ensuring that Flutees protective sleeves are almost invisible on skin. Finally, the question remains: how to deal with the “ridges”, the little sharp edges that can form around the “shielding plate” when the sleeves are first turned out of the Flutees clasp. We have cut the outer edge of the “shielding plate” in such a way, that a potential ridge will always point away from the skin of the ear lobe and there is no contact with the earlobe. Not only material and design details affect the palatability and secure application of Flutees protective sleeves for ear studs; impeccable hygienic standards are just as relevant. Because of this, Flutees protective sleeves for ear studs are processed under clean room conditions, entailing an environment in which the amount of air particles is kept low with help of air pressure, airflow, relative humidity and room temperature. The people working in the clean rooms wear special work clothes such as caps, gloves, breathing protection and even shoe covering. For industries such as pharmaceutical, medical and food production, the clean room has become indispensable. The same applies to Flutees protective sleeves for ear studs, which are not only packaged but even produced in this clean environment. Right after hayfever contact allergy is the most common allergy. Today over 3000 different contact allergens are listed. Nickel sulfide is thereby one of the most reactive. Before the body reacts on nickel and shows symptoms such as an effected earlobe a sensitization takes place. Research tells that people wearing earrings and/or piercings are above‐average affected by nickel allergy. The EU issued the so-called Nickel Act to react to this circumstance. This Act refers to all jewelry pieces and limits the amount of nickel that a jewelry piece and therefore also an earring is allowed to release while wearing. Since the introduction of the Nickel Act the amount of young people with nickel allergy declined. However, the rate of middle-aged and elderly persons with nickel allergy stayed the same. There are multiple reasons for this. On the one hand it could be possible that older nickel allergy sufferers have gained the allergy before the introduction of the Nickel Act. On the other hand it might also be possible that there is a correlation between the sensitization and the duration of the contact with the allergenic material. Doubtlessly, the Nickel Act reduced the amount of nickel in jewelry. Nevertheless, the body, when having much contact with nickel, is able to build antibodies against the allergenic material over time (sensitization). This possibly results in a nickel allergy at an advanced age. Once the sensitization or contact allergy has emerged it usually stays for a lifetime since this form of allergy is a stable reaction of the immune system. Factors such as sweating, humidity and high temperature may foster the release of nickel. That might be the reason why earrings and piercings have a huge impact on the acquisition of a nickel allergy. Until today there are no medical solutions to prevent nickel sensitization or to cure an already existing nickel allergy. The only solution is to avoid the contact with the allergenic material. Due to the high impact of wearing earrings and piercings on the sensitization of nickel this particular prevention is of utmost importance. Reactions such as infected, burning or itching earlobes do not only occur on people with nickel allergy but also on those without. Responsible for this fact can be different metals. Cobalt for instance, that is used in many alloys is a common allergy trigger. Also dirt or other impureness on the jewelry might cause skin irritation. This could be the reason why some people spontaneously react on a pair of earrings that they used to wear before without having any problems. Often it is the case that only one of the earlobes becomes infected when wearing particular earrings. Flutees protective sleeves for earrings not only help those with nickel allergy to wear the earrings they like but also prevent reactions with other metals or impurity. 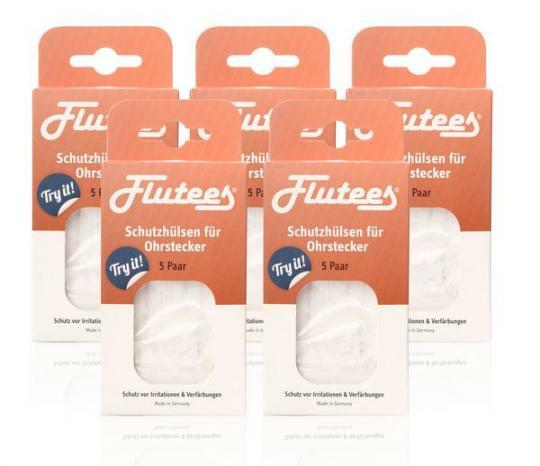 Flutees protective sleeves for earrings are available in German pharmacies. Where can Flutees be found? Flutees can be bought via the Online-Shop as well as in pharmacies in Germany, Austria and Switzerland, see Tab "Flutees in Pharmacies". How often can I use a pair of Flutees? Flutees protective sleeves for ear studs are a product – like earrings – for which hygiene should play a significant role. We can only guarantee perfect hygiene of our product up to the date when the medical foil packaging is opened. In addition, the sleeves have a delicate texture. Only users can judge whether, after multiple applications, the protective sleeves are still intact and still full fill their protective function. The same applies to the fasteners that begin losing their grip after multiple application due to fat- and humidity particles. For these reasons, we can only recommend onetime application, even if the sleeves are strong enough to use them several times. If you decide to use Flutees two or three times, please take them off at night and clean and control the product regularly. Why do Flutees not fit into every ear hole? The outer diameter of the Flutees protective sleeves for ears studs slightly exceeds the size of a commercial ear stud pin. Some ear holes are so narrow that the protective sleeves cannot be inserted in the injection canal despite their small outer diameter. A piercing can serve as guidance whether the Flutees protective sleeves will fit into an injection canal. The outer diameter of the Flutees protective sleeves is only 5 hundredths of a millimeter bigger than the diameter of the smallest standard piercing pin. Why do Flutees not fit onto every ear stud? Pins of ear studs are not standardized and are different in length and diameter. Additionally, some ear studs feature a distinct thickening between the jewellery part and the pin of the earring. In this case, since the sleeve is inflexible, it will not be possible to slide it up to the jewellery part, which means the ear stud will stick out from the ear lobe in an unbecoming way. The inflexibility of the pin is also the reason why pins with a diameter larger than 0.9 mm cannot be covered by the protective sleeve. The protective sleeve would have to be able to widen to fit on a diameter exceeding 0.9 mm. Why ae there no Flutees protective sleeves for earring hooks? As the idea for developing the Flutees protective sleeves was born out of being personally affected and the piece of ear jewellery that induced the initial product development was an ear stud, the obvious first step was to develop protective sleeves for ear studs. Flexible protective sleeves to use with earring hooks are already in the pipeline. Can i wear Flutees even with a plastic allergy? No. Please refrain from using Flutees protective sleeves for ear studs if you have an allergy to plastic.